Want to know a secret the video pros use? Videos that make the most impact use a potent combination of words and images that stimulate the emotions of viewers. Video Emotion Potion is a powerful system that uses psychology, words and graphic characters to exploit "trigger emotions". Tons of the highest quality animated characters that display a range of emotions. The Video Gap...an easy to follow system for choosing the best words for your video scripts. It's been proven scientifically that when people view other people showing emotions, their brains will feel the same emotions, even if the other "people" are cartoon characters. It's also proven that reading and hearing certain words also stimulate our emotions. Sales experts call these words "trigger words" because they are shown to stimulate certain emotions when people read or hear them. Emotion Potion makes it easy to combine emotion-tugging visual characters with the most compelling words to make videos that really get results. All you need to do to make GREAT videos is to add an animated character and sprinkle in some "emotion trigger words". Making effective videos is easy to do...if you have the right tools and resources. The video above just uses some quick examples I threw together. Your possibilites are truly limitless. But you can see for yourself how easy it is to use Emotion Potion to make powerful videos. I simply used the MP4 versions for Mary and added some basic text. It would be even better if I used a voice over exploiting more trigger words, but it demonstrates how fast and easy it really is to make good videos. The Emotion Potion comes with 12 different mascots, 6 male and 6 female. Each character has 14 different poses showing a variety of emotions. With Video Emotion Potion, you're getting a huge collection of animated characters that display a range of emotions that were designed to get your viewers to FEEL. People act on their feelings, THEN justify their actions using reason. There are 12 different characters included in your Video Emotion Potion download, 6 males and 6 females. Each has 14 different actions and come in a variety of formats so you can use them in your favorite video making programs. The video above uses Emotion Potion MP4 videos that were clipped to 5 seconds each for the demo. Your videos will be 12-14 seconds each. Here's the PNGs (still images) for each character. Remember, these are just thumbnails and the actual images are MUCH larger and each also has a SWF animation and MP4 video file too. Next, you need to use the best words in your videos, both as text and in your voice overs. 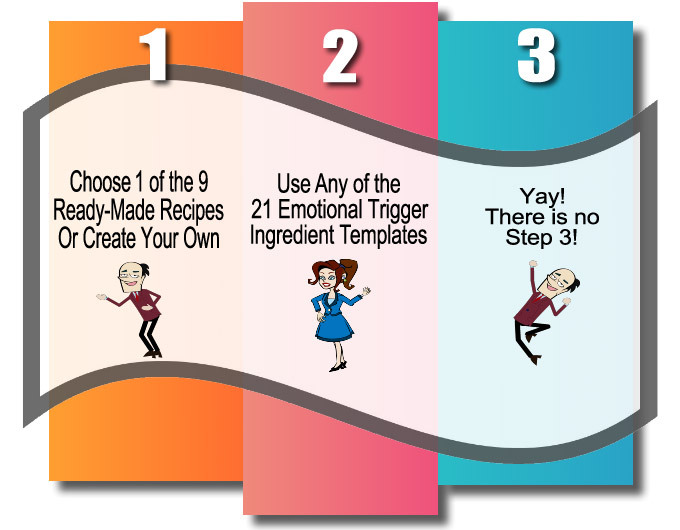 The AIIDA Recipe - Add INFORMATION to the basic AIDA. Step 2: Add "ingredients". Ingredients are the individual scenes or "slides" that make up your videos. Each scene or slide should have one main purpose. The Video Gap System lets you focus on the main goal of each slide. Included in The Video Gap System are 21 various templates, each utilizing a different "ingredient" and were specifically created to make writing and designing the individual slides or scenes of your video as fast, easy and effective as possible. Plus, you can always add your own ingredients whenever you want. Takes Full Advantage of "Trigger Emotions"
Trigger emotions are feelings stimulated by the best copywriters and script writers. Despite what we all think about ourselves, humans are emotional beings. We buy using much more emotion and less logic than we want to admit. The best video marketers know how to make viewers FEEL certain emotions. Examples of trigger emotions are anger, happiness, feeling secure, feeling loved, being afraid, etc. The 21 Video Gap templates each contain a variety of suggested words and phrases selected specifically to focus on one of the 21 included trigger emotions. video scenes virtually write themselves! You're Also Getting Two HUGE Video Gap Character Sets! These Animation Sensation characters were designed to visually display trigger emotions to give your videos even more psychological impact. Are fully animated. People expect motion and movement in videos and Animation Sensation characters are full of movement. Displays a huge assortment of human trigger emotions, such as happy, angry, frustration, hurry, and more and more. The short 90 second video above is just a small sample of your characters. Check out the thumbnails below for the full collection included in your downloads. Keep in mind that the Lenny and Barb characters shown above also have fully animated GIF versions! And That's Not All! Also Included is The Freudian Tips Report! You're also getting the Freudian Tips Report, jam-packed with tips, trick and techniques the most successful marketers use to make more money. Also included are sure-fire ways to create ideas for videos that are simple, easy and get results. ✓ Are you "hung up" over the sound of your own voice? Using this simple method will cure your "I hate my own voice" blues, setting you free to create tons of content. ✓ You'll learn how to master this simple technique that will cure your video script writer's block once and for all. ✓ You're also getting tons of tips and tricks for creating "localized" videos that will connect with just about any local market. ✓ I also reveal my "Quick Hitters", which are my best video hacks for making marketing videos as fast and easy as possible. ✓ Explore how to build confidence in your viewers: state, borrow and manufacture authority. ✓ Uncover how to dramatically increase your results by segmenting your viewers. Not only will you get much better results, your viewers will greatly benefit too. It's a real win/win. ✓ Stop wasting Youtube views! No ifs, ands, or buts about it! This is one Youtube feature you MUST exploit! ✓ How and why you need to create an "avatar" of your viewing audience. ✓ You'll also find the "Almost Like Magic" Amazon Review Trick. Know what buyers like and dislike BEFORE writing a word and be able to anticipate their wants and needs in your offers. 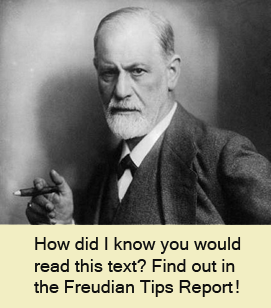 Plus lots and lots more..the Freudian Tips Report is fascinating, interesting and powerful. Emotion Potion Character Set - 6 male character sets and 6 female character sets. Each set has 14 MP4s, 14 Animated SWFs and 14 still PNG images. Video Gap Character Set - 85 animated GIFs and 85 still PNG images. 44 Lenny. 41 Barb. The Video Gap System - Easy to follow system for creating video scripts that get results. Freudian Tips Report - Fascinating and informative guide for using psychology in your video projects. Plus Secret Bonuses - Get even more! and any number of your clients' video too!